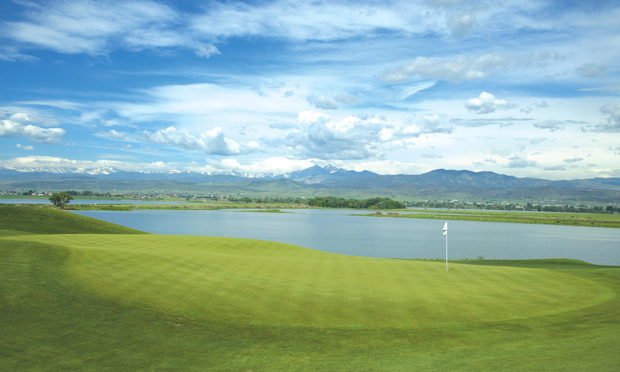 The state’s first new course in a decade, TPC Colorado in Berthoud reaches for the stars with a sublime course design and high-end lakeside community. 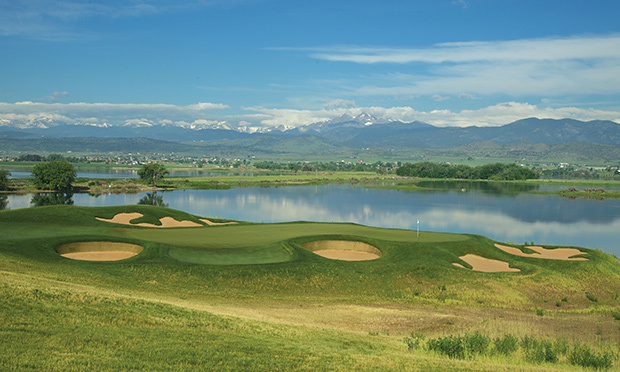 The state’s first new course in a decade, TPC Colorado in Berthoud reaches for the stars with a sublime course design and the blueprint for a high-end, outdoor-oriented, lakeside community. 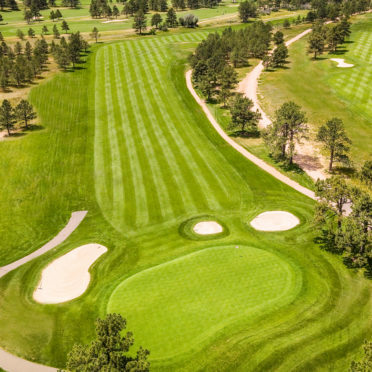 The par-3 16th hole at the semi-private TPC Colorado in Berthoud, which will open on Aug. 1, could become one of Colorado’s most iconic one-shotters—or at least the most entertaining to play. Appropriately named “Center Stage,” this 140-yard downhiller features a teeing area stretching 70 yards in width, about the breadth of a medium-sized driving range. Believed to be the widest in the world, it backs up against what will be a $20-million, Western-lodge-style, 50,000-square-foot clubhouse, with a covered outdoor patio providing a ready-made gallery and the ultimate “Golfer’s Perch.” From the tee on the highest ridge of TPC’s sprawling 800-acre property, it’s a 60-foot drop to a devilishly shaped and imposingly bunkered green, with McNeil Reservoir, the foothills, and the snow-capped heights of 14,259-foot Longs Peak providing a spectacular, quintessential Colorado backdrop. The signature par-3 16th features water, mountain views and tees next to the clubhouse patio. “There could be 100 people watching you,” imagines TPC General Manager Larry Collins, noting that self-conscious players can move down to the hidden forward tees, where they can literally putt to the green. 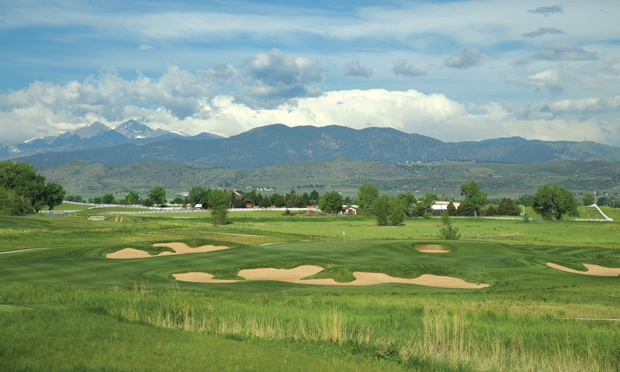 “It’s an opportunity for recreational golfers to feel like a pro, with a short club in their hands,” says architect and Colorado native Art Schaupeter. On a recent bluebird day in May, Schaupeter can’t help but grin as he surveys the 16th’s multi-tiered green complex. It encompasses 9,000 square feet and, coupled with the variety of angles offered by the improbably wide tee, can be set up to play like four very different golf holes, all with unique challenges. Most notable: The lower left side of the green is protected by two pot bunkers and will require a precisely judged shot, while the tiny shelf on the far right seems the likely Sunday pin when the Web.com Tour comes to play next summer. 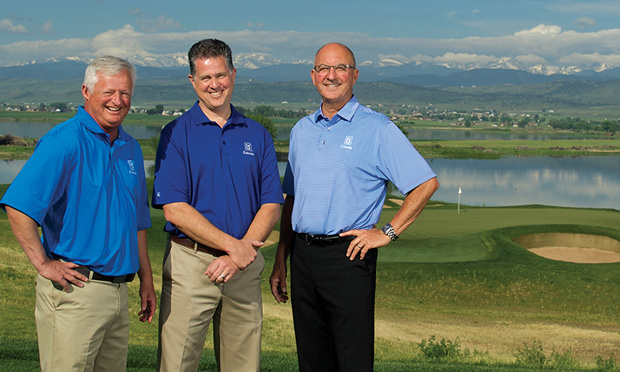 For veteran Northern Colorado developer Jon Turner, who is partnered with Chris Frye and Jim Birdsall, TPC Colorado is the “marquee project” in a long career. It’s also one that can create a national and even international footprint; the club’s first founding member hails from Southeast Asia. “We’re breaking new ground here,” Turner readily admits, referring to both the TPC-quality golf course and the ambitious resort-like community that will surround it. When Turner decided to affiliate with the TPC, banking on its prestige and 34-course network of affluent golfers, he ended up doubling the course construction budget. But he also stuck with his gut by eschewing big-name architects in favor of the up-and-coming Schaupeter, who had designed Turner’s Highland Meadows course in Windsor back in 2004. Growing up in Wheat Ridge as a hockey player rather than a golfer, Schaupeter earned a landscaping degree from the University of Colorado. Hired in 1991 by St. Louis-based architect Keith Foster, whose dozens of commissions include The Quarry in San Antonio, Schaupeter became Foster’s lead designer. He shaped Commerce City’s Buffalo Run and Steamboat’s Haymaker, and, after opening his own shop, he designed The Club at Old Hawthorne, the home course for the University of Missouri. Both Schaupeter and Collins first walked the Berthoud site back in 2005, and after waiting out the Great Recession, Turner tapped them when work finally began in earnest a decade later. It helps that Schaupeter is intensely dedicated, flexible and modest, and that Collins brought his long association with the TPC to the table. “Art was the only [architect we interviewed] who said, ‘What do you want?’“ recalls Collins, who himself played collegiately at Southern Cal, competed on the European Tour, worked at TPCs in three other states, and was most recently the director of golf at Omni Interlocken in Broomfield. While the Berthoud area, 50 minutes north of Denver and 30 minutes south of Fort Collins, evokes images of endlessly flat farmland, the site is blessed with character and far-reaching views. It capitalizes on three interlocking reservoirs: the smallest, McNeil, wedges between Welch to the south and Lonetree, the largest, to the west. The site is also home to a sizable heron rookery—thus the official name of TPC Colorado at Heron Lakes—and will become part of the Audubon Cooperative Sanctuary Program. The community itself is planned to include more than 1,400 high-end single-family homes, villas, townhomes and condos, and is envisioned as the gold standard for the 21st-century multi-amenity club. The Lonetree Marina and Beach Club will offer waterside dining and motorized boating, while the McNeil Beach Club is designed for kayakers and paddle boarders. There will be fishing, waterfowl hunting, eight miles of biking and hiking paths, swimming, tennis, a fitness center, commercial space, and even a 300-seat ballroom in the massive main clubhouse, which will serve as the community hub. TPC is a walkable, single 18-hole loop in the Scottish style; there will be a halfway house and even a practice putting green at the turn (a requirement for PGA events where the field starts on the front and back). There are no mediocre or forgettable holes, and no two are alike. The 55 acres of fairways, lined by fescue, are extremely generous, but strategically designed bunkers protect the landing areas of all but a couple of holes. 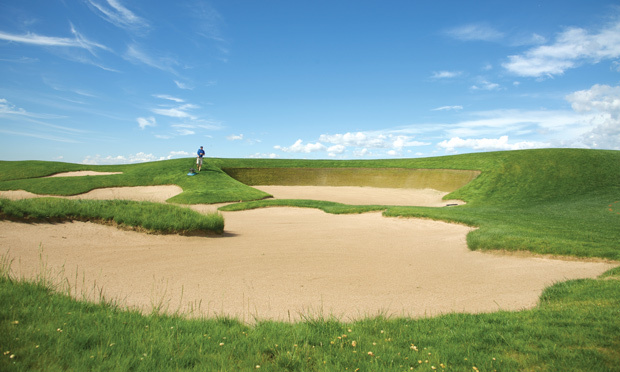 More specifically, there’s a healthy dose of penal, stacked-sod-wall pot bunkers that will place a premium on strategy (stacked sod is nearly impossible to maintain in Colorado’s climate; these are synthetic, made from a material called Durabunker, yet surprisingly realistic). With five formal teeing areas plus two more in the fairways, TPC can stretch from 4,157 yards up to 7,991 (rating 76.9, slope 140) for the young guns on the Web.com. 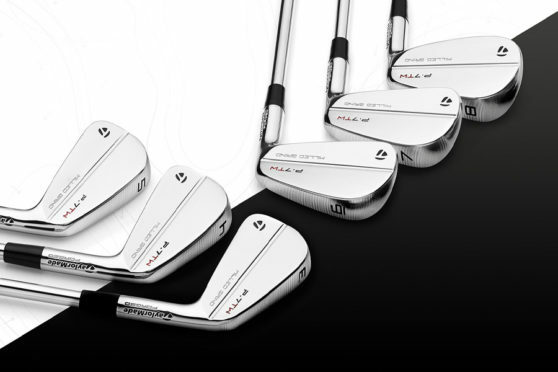 Turner’s goal was to make it playable for the average golfer, while also challenging a PGA-caliber field. The vast majority of men will play the blue or the gold, at 6,141 (68.8/120) and 6,875 (72.3/123) yards, respectively (perhaps TPC could bridge that substantial yardage and rating gap by creating a combo tee). Two pot bunkers frame the landing area of the opening par 5, providing the option to run the gauntlet, catch the downslope and go for the green in two, but it’s protected by a deep moat, reminiscent of the opener at St. Andrews. The second perches on a bluff above a natural lake and evokes the famous French par-3 design, Biarritz, with a deep swale in the middle of the 11,500-square-foot green, creating three distinct plateaus. The short sixth, one of three reachable par-4s, emulates the famous 10th at Riviera, with its diagonal, elevated green. 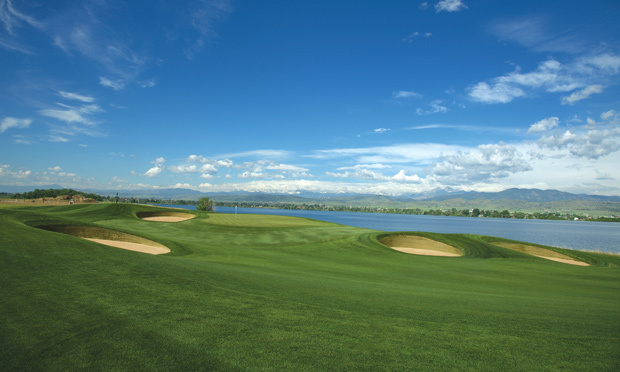 The par-3 eighth, called “Revelation,” plays directly toward the mountains onto a narrow, natural peninsula that juts into Lonetree Reservoir and is framed by large cottonwoods. The only trees on the course, they are partially underwater when the reservoir is at full capacity, evoking Florida swamplands or the Carolina coast. When the leaves light up in the fall, it will take on yet another picturesque personality. 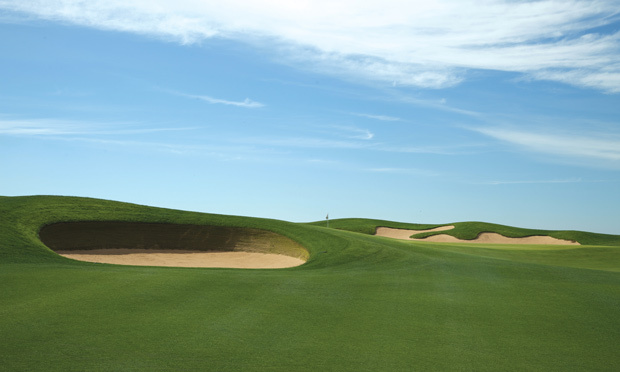 The risk-reward uphill 10th plays alongside Lonetree, with the natural, undulating ground setting up a variety of options, including flying a greenside pot bunker to reach the green. The 13th (“Longer Still”) is the longest par five in the state at 773 yards from the tips, and features Schaupeter’s own version of St. Andrews’ Hell Bunker, a 110-yard-long, randomly fingered expanse of sand punctuated by three distinct hollows with stacked-sod faces. The 15th, an uphill, reachable par 5 called “Temptation,” features a green sitting up in a partial punchbowl, protected on the left side by a pot bunker and a slope that, if judged properly, will funnel the ball onto the green. The 18th is a muscular and fitting finale, the longest par 4 on the course, 454 yards uphill from the gold tees with a deep pot bunker just short of the green. 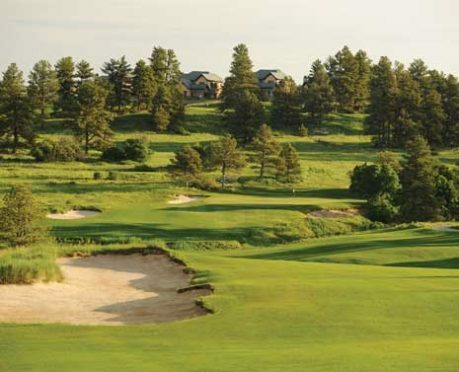 TPC Colorado is providing a wake-up call for Berthoud, a leafy, sleepy community that calls itself “the Garden Spot of Colorado.” Paralleled to the west by Hwy. 287 and to the east by I-25, the town is bisected by Hwy. 56—known there as Mountain Avenue, its tree-lined main street. Berthoud is a bedroom community, with 85 percent of its residents commuting to work while also making 85 percent of their purchases—dining, shopping, etc.—in another ZIP Code, typically Loveland or Longmont. After enacting strict growth controls in the early 2000s, followed by the slowdown of the Great Recession, the development spigot is wide open now, beginning with the TPC. There is also a 4,000-unit multi-use development in the pipeline, called Wilson Ranch and backed by Bill Gates, that is ready to launch. Population has jumped from 6,000 to 8,000 residents in that past two years, and could increase to 15,000 or even 25,000 in the next decade or two. The challenge, according to Berthoud Community Development Director Curt Freese, is that the town’s commercial development, and resulting tax base, is inadequate. Berthoud needs more retail and restaurants to create the amenities residents expect, from swimming pools to bike paths to rec centers. Freese and other town leaders see TPC as the major driver to start changing that dynamic. Drawing from both the north and south, TPC has already beaten its projections by selling 161 founding memberships through the end of May. Initiation is $25,000, with dues starting at $325 per month and then rising to no more than $575 per month when the clubhouse opens next summer. 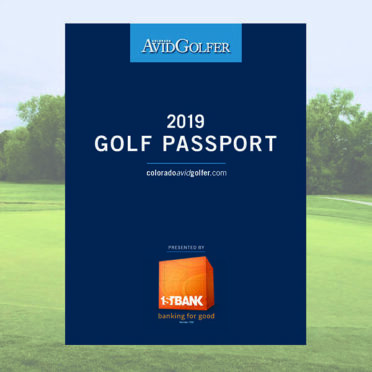 Membership also includes access to TPC Passport, with playing privileges at private TPC and Heritage Collection properties up to six times annually, and 50 percent discounts at TPC resort properties. 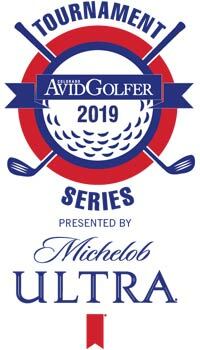 Rounds for non-members are $150, with a $20 per person cart fee. Real estate sales have also been brisk, with just 15 lots left from the first phase of 126 offerings. 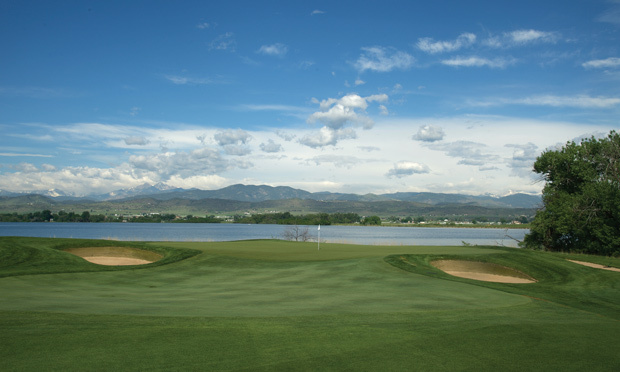 While the development is high-end, it is affordably priced compared to other luxury golf course offerings in the mountains or premier Denver locations. “We’re a pretty good buy,” Turner says. Lots start at around $170,000 for .3 acres and climb to $760,00 for larger parcels with prime views, and there will be condos at much lower prices. On the high end, a handsome, 7,200-square-foot lodge-style spec home being built this summer on a .7-acre lot is priced at $2.495 million. In general, the housing is minimally invasive, with only one or two holes where there could be future development on both sides. When the course opens to the public Aug. 1, TPC is hoping to have at least cart storage finished in the first, 5,500-square-foot phase of the massive clubhouse, the remainder of which is set to be completed by next summer, preferably by the time the Web.com tour comes to town. The club has a five-year agreement to host, but the PGA Tour has not yet released the 2019 Web.com schedule. While Turner is silent on future opportunities, the scuttlebutt is that if all goes smoothly, TPC Colorado could some day be in line to host USGA or PGA events, maybe even a Fed Ex Championship playoff, perhaps in rotation with other premier Colorado venues, such as Cherry Hills or Castle Pines. 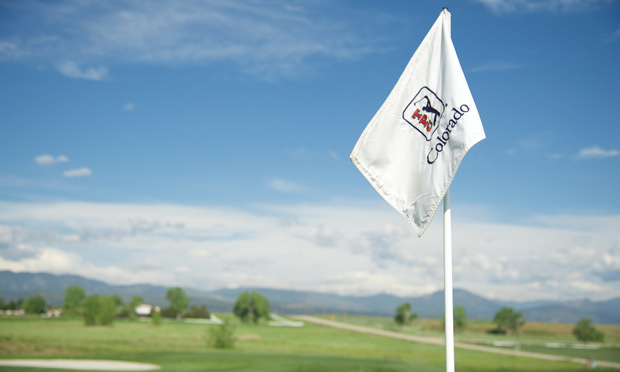 If that happens, TPC Colorado will indeed be on the Center Stage. CAG Contributor Andy Bigford co-authored Freedom Found, the Warren Miller autobiography, and Ski Inc, a memoir with Chris Diamond.